A few weeks ago a very exciting package arrived and being a massive lipstick lover I was highly excited to try out Lancome’s latest lipstick launch. Now I know I say this with each time I have been sent something from Lancome, but I honestly never expect to receive such lovely products and I am truly grateful After giving these lipsticks a little road test, I thought it was about time I shared my thoughts on why I have really been enjoying these lipsticks. Apart from Lancome’s last lip release I haven’t ever tried any of their lipsticks, so I was really excited to try these out as i’d seen a few reviews already on these lipsticks so I was highly anticipating how good these lipsticks were going to be, and whether i’d like them! When it comes to reviewing beauty products I typically only review the ones that I do genuinely love, but also products that I know you as readers will love also and these are definitely lipsticks that i’d highly recommend splurging on! The Lancome L’Absolu Rouge Lipsticks* (£25.50) are the latest addition to Lancome’s highly loved line of lipsticks with this particular being a relaunch of their cult lipstick in order for your lip colour to really speak out more than ever. With this revamp and relaunch Lancome are bringing back their cult classic shades whilst also throwing a new range of shades into the mix in order to update with the latest lipstick trends, from perfect nudes, classic reds and vibrant pinks making the shade range totally versatile to every lipstick lover out there. With three lipstick formulas in this range it just further adds to the versatility of this range, meaning there is a formula to suit everyone including sheer, cream and matte, which you don’t often see from a brand/certain product. I very kindly received two shades from this range, of which are both stunning in their own right. Firstly we have ‘Rose’, which has the name suggests is a lovely rose red shade with an ever so slight pink undertone, which makes it more wearable for me as i’m not a huge fan of the classic red lip. The formula of this lipstick is a cream formula, and although I am more of a matte girl nowadays I do really like this formula. It glides every so smoothly, but is still very pigmented and it’s not at all drying which is great especially as we’re now in the winter months where my lips are just awfully dry all of the time. Secondly we have Nuit & Jour which is a more of a subtle peach shade and as the formula of this is sheer it does just give a lovely hint of colour whilst making your lips look glossy. As i’m not a huge fan of sheer lipsticks personally I doubt i’ll be getting much wear out of this shade but if you’re a lover of subtle/sheer shades then you’ll love this! My favourite part of these lipsticks has definitely got to be the packaging as i’m easily pleased, but these lipsticks are push and click style lipsticks which I just think has a level of class and sleekness to them that I just love. It also means that the lid can’t come loose in your bag, thus ruining your lipstick which I am so guilty for as i’ve ruined a lipstick or two in my time! If you’re wanting to try out a new lipstick with wide range of shades and formulas to choose from, then i’d highly recommend trying these as they are such lovely lipsticks and no doubt you will find a shade or two to suit you. 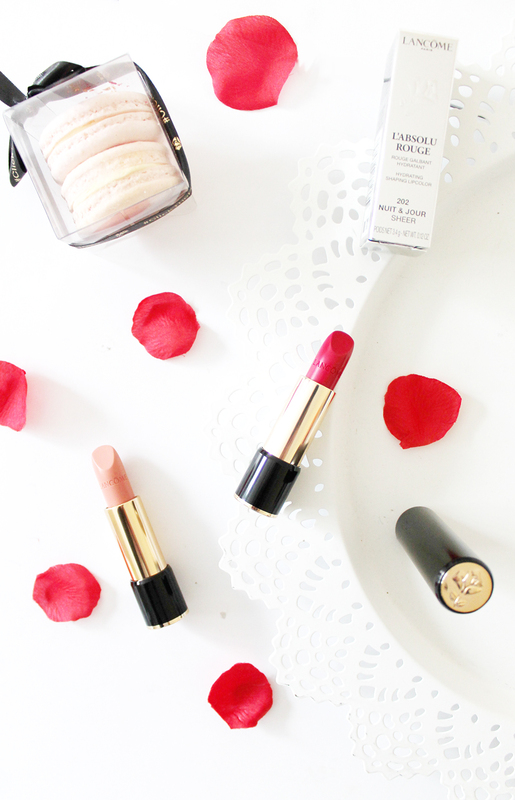 Have you tried any lipsticks from Lancome?